Years ago when I was sitting at the stove stirring a batch of my homemade marinara I got to thinking, “Couldn’t this be done in the crock pot?” I figured the least we would be out was one meal if it didn’t work and I’d throw everyone a PBJ and toss the sauce. BUT. IT. WORKED! Beautifully, at that. The sauce turned out great and no stirring and it could be prepared before the dreaded “witching hour” and be ready when we were! SUCCESS! Below is the video tutorial I posted several weeks ago that shows me (yes, barefoot, pregnant and in the kitchen – and with a toddler hanging on my leg…) making it. If you want the recipe ingredients scroll a little farther down and I will list them for easy access. Several of you have commented that you tried it out and it worked brilliantly for your family as well! Thanks for the feedback. Comment below or in the YouTube video and let me know how your family liked it! I love hearing from y’all. Saute the onion in oil for 5 minutes on med. high heat. Add the garlic and seasoning and warm for flavors to mingle. Turn off heat and set aside. (If fixing in the morning or crammed for time you can skip sauteing the onion/seasoning without it affecting the overall flavor too much) In slow cooker add crushed tomatoes, tomato paste, sugar, zucchini and onion/garlic/seasoning mix. Stir up and set on low for 4-6 hours. Mix everything thoroughly and shape into balls. 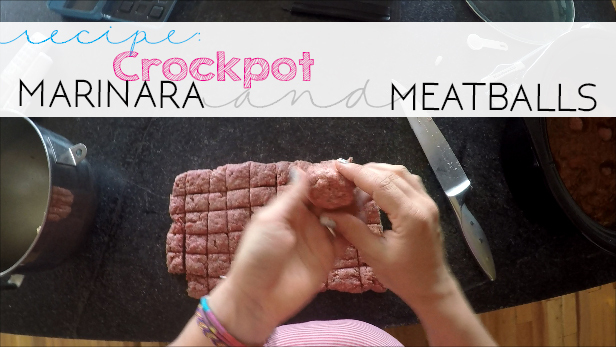 If you are having kids help yet still want evenly shaped meatballs check out the tip I share HERE in the video. Meatballs can be cooked in a 400 degree oven for 15 minutes (or longer if they are large – check internal temp) or can be thrown into the crock pot with the sauce to cook in the sauce (WAY easier and SUPER tasty). If you are doing this I would suggest cooking on high for 2 hours and then turning it to low for another 2 hours. You can experiment with your slow cooker and see what works. Just be sure to check the internal temp a few of the top center meatballs. This is our family’s new favorite dinner! Thank you so much for sharing. I doubled the recipe and had it cooking in two crock pots then divided it up and froze it for quick meals. Thank you for doing this video and posting the recipe. I also appreciate the baby at your feet and the children voices in the background. God bless your family. Just made your recipe last week and we loved it. Thank you for sharing it.